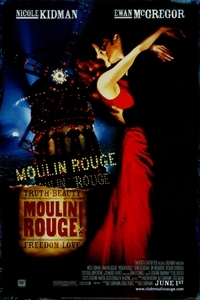 Synopsis: Moulin Rouge (2001 – Rated PG-13). Starring Ewan McGregor and Nicole Kidman, the film by celebrated filmmaker Baz Luhrmann (Romeo & Juliet, Strictly Ballroom, The Great Gatsby) is a tour-de-force of music, drama, and spectacle. Luhrmann defies convention by setting the film in 1890’s Paris but filling it with contemporary music by artists such as Nirvana, Madonna, and Queen, among others. The story follows Christian (McGregor), a young idealistic poet who falls in love with the courtesan Satine (Kidman) who is the star of the Moulin Rouge and coveted by a jealous duke. Their doomed romance forms “A rare picture that gets you intoxicated on the possibilities of movies.” (Chicago Tribune). Moulin Rouge plays Tuesday, April 23 at 7 PM.